Read articles written by very well-known personalities and eminent authors about their views on Gandhi, Gandhi's works, Gandhian philosophy, Satyagraha and Civil Disobedience. Satyagraha is the most important contribution of Gandhi to social philosophy and movement. It emerged as a weapon of conflict resolution. The concept of satyagraha could be understood in the broader context of Gandhian socio-political thought that developed out of actions, which he called 'Experiments with Truth'. It was aimed not merely at political change, but at the complete social, political, economic and cultural transformation. So far as its contemporary relevance as a means for attainment of justice and conflict resolution is concerned, diverse worldwide social movements drew and continue to draw inspiration from the Gandhian Way. Gandhian Way is a holistic philosophy of life and society equally applicable to national and international settings. The uniqueness of this way is primacy of morality over power politics. Truth is God' and emphasis on ends & means continuum say it all. Gandhian Way rejects the western philosophical tradition of ends justifying the means. Purity of ends is an essential ingredient. In the Gandhian way, the solution of any conflict lies in die method of its resolution. Truth with non-violence is the only pure means to achieve the goal of a peaceful world order. Gandhi gave a revolutionary turn to social reform movements. He applied satyagraha in the non-violent struggle against injustice, exploitation and dictatorship. Gandhi's world view is rooted in his concept of peace, which was comprehensive. It was neither mere absence of war nor acceptance of non-violence as a strategy. He linked peace with truth achieved through non-violence. Transformation of individual was an essential element of satyagraha. Emancipation from human misery was an essential precondition for social transformation. He was not attempting any piecemeal social engineering, but a total transformation of both man and society. Gandhi's fundamental belief is in satya, 'truth,' which he also calls God. Satya is the ruling principle of the universe. Satya manifests itself in all living beings, especially in humans, as self-consciousness or soul or spirit. According to Gandhi, love is the law of our being.4 The only appropriate relation between human beings is love. And by love he means what one may usually call compassion that is unconditional practical concern for the welfare and happiness of others. Such love implies ahimsa, non-violence, as a principle of social and political action. The achievement of political and moral ends through ahimsa is what Gandhi called satyagraha, 'truth force' or non-violent action, which is not passive or sullen. It calls for courage, strength of character and positive contribution to a righteous cause. Gandhi's doctrine of non-violence is absolute. In some circumstances, he thinks, it might be better to choose violence than submit to injustice. For Gandhi, civilisation is that mode of conduct which points out to man the path of duty. Performance of duty and observance of morality are convertible terms. To observe morality is to attain mastery over our minds and our passions. Gandhi proclaimed ancient civilisation of India to be the best. The tendency of Indian civilisation is to elevate the moral being. Gandhi saw the state as the antithesis or how human beings should be organised. It institutionalises violence. It commands, compels, constrains. It encourages dependence and undermines self-reliance. In a word, the state dehumanises human beings. Yet it is indispensable because human beings lack the capacity to govern themselves. Gandhi's answer to this predicament is plea for a 'minimal state.' In the Gandhian concept of village republics, conflict will be resolved constructively through discussion and negotiation. The ends of such a state will be achieved not through threats and force, but through persuasion and consensus. Crime will be regarded not as wrong-doing to be punished, but as an illness to be treated with help and understanding. On various occasions, Gandhi clarified the difference between passive resistance and satyagraha. Satyagraha is a more dynamic force than passive resistance because it contemplates prolonged mass action in resistance to injustice. Secondly, satyagraha can be practised at all levels; domestic, national and international, while passive resistance is contemplated at a political level only. Thirdly, satyagraha offers continuous purification of mind. It has no place for hatred, while passive resistance may be compatible with internal violence towards the enemy. Gandhi said: 'Satyagraha differs from passive resistance as the North Pole from the South. Passive resistance may be offered along side of arms. It, often, is looked upon as preparation for arms.' But satyagraha and violent resistance are absolute antagonists. Passive Resistance was conceived as a weapon of the weak and does not exclude the use of physical force or violence for the purpose of gaining one's end, whereas satyagraha was conceived as the weapon of the strongest and excludes the use of violence in any shape or form.5 In satyagraha there is no attempt to coerce or terrorise the opponent.6 According to Gandhi, satyagraha has two essential constituents: Righteousness of cause- good End and purity of Weapon- good means. End-Means continuum is the base of the Gandhian Way. Satyagraha inculcates agraha or moral pressure for the sake of truth. Gandhi states: 'The world rests upon the bedrock of satya or Truth. Asatya, meaning untruth, also means non-existent; and Satya or Truth means "that which is". If untruth does not so much as exist, its victory is out of the question. And Truth being "that which is" can never be destroyed. This is the doctrine of Satyagraha in a nutshell.7 He said: "The very insistence on truth has taught me to appreciate the beauty of compromise. I saw in later life that this spirit was an essential part of Satyagrah. "8 Gandhi had immense, deep and consistent faith in God as Truth. Suffering serves three purposes: it purifies the sufferers; secondly, it makes a direct appeal to the soul of the oppressor; thirdly, it intensifies favourable public opinion. Satyagraha has various forms. Fasting can be one extreme form of satyagraha. Gandhi held that fasting and prayer give the required discipline, the spirit of self-sacrifice, humility and resoluteness of will. Fasting can be applied against those who are responsive to moral persuasion. Gandhi held that fasting sets the soul free for efficacious prayer. He firmly believed that the great teachers of the world have derived extraordinary power for the good of the humanity and attained clarity of vision through fasting and prayer. Complete peace is three dimensional: manasa meaning maintaining peace in heart, vacha meaning maintaining peace in thought, karmana meaning maintaining peace in action. One who is fearless, free of enmity, impartial and aspires for supreme public interest that is truth can be a satyagrahi. One does not surrender before power based on coercion and violence. One who is determined to fight evils and one who accepts truth and truth only can be a satyagrahi. A Satyagrahi should not have any vested interest to protect. Gandhi's experiments with truth taught him revealing lessons about satyagraha. Writing in Navajivan on 5 July 1925, Gandhi observes that at the beginning of satyagraha enthusiasm, unity and perseverance is witnessed, while in the midst of the struggle tendencies of pessimism, apathy, internal feuds and jealousies are witnessed. Only a few handful of people show unwavering faith, steadfastness and tolerance. 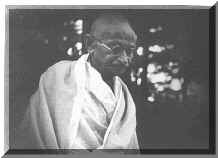 Gandhi had unstinted faith in sacrifice, truth and non-violence. A person who adheres to truth has all the worldly gifts and he faces God. Hatred and enmity cannot stand near non-violence. For those who can withstand suffering nothing is unattainable. Gandhi's strongest point is that he attempted to live according to his teachings. The sincere effort for the realisation of his ideas in his own life, in the lives of the inmates of his ashram and in the social, economic and political life of India, imparts to Gandhian teachings a great solidity. Gandhi refused to take advantage of the weaknesses of his opponents and would willingly give up his hard won political victories if that would satisfy the minority. Gandhi's approach to peace is based on satyagraha. Satyagraha is the moral alternative to war. Gandhi showed us the way to use it for problem-solving and conflict-resolution from micro-level to macro- level. Gandhi's satyagraha proved to be an effective means for political redress. Many of the contemporary challenges related to war and peace, terrorism, human rights, sustainable development, climate change, socio-political unrest, and politico-administrative corruption could be faced through adoption of the Gandhian Way. The twenty-first century world has much to learn from it. Young India, August 11, 1920. S. P. Venna, Modern Political Theory ( Delhi :Vikas, 1975), p.411. M. K, Gandhi, Satyagraha in South Africa, Part I, Chapter 13 on 'Satyagraha versus Passive Resistance' (Ahmedabad: Navjivan Press, 1968), pp. 126-131. M. K. Gandhi, Vykom Satyagraha, Young India, May 1,1924. M. K. Gandhi, Satyagraha in South Africa, Part II, Chapter 16 on 'Women in Jail'(Ahmedabad: Navjivan Press, 1968),p.323. Mark Tully, India's Unending Journey: Finding Balance in a Time of Change (London : Rider, Random House, 2007), p.47. Jawaharlal Nehru, An Autobiography (New Delhi: Oxford University Press, 1989), p.73. Antonino Drago, "The Birth of Non-Violence as a Political Theory", Gandhi Marg, 29:3, October-December 2007, pp. 275-295.